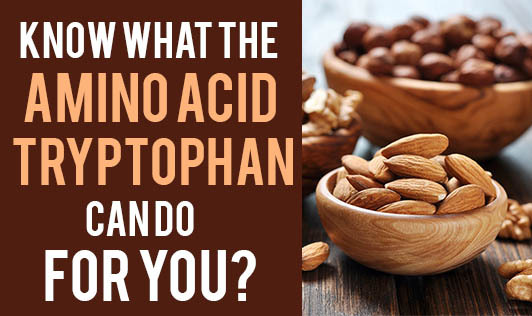 Know What The Amino Acid Tryptophan Can do For You? You should have heard the Health experts speaking about the compound Tryptophan that is essential for every one for their good health. What is it? Tryptophan is one among the 9 essential amino acids. It has to be obtained from the diet as the body cannotproduce it. It is needed for normal growth in infants and for nitrogen balance in adults. 1. A small amount of the tryptophan that we get in our diet is converted into niacin (vitamin B3) by the liver. This helps prevent the symptoms associated with niacin deficiency when the dietary intake of this vitamin is low. 2. It helps to raise the serotonin levels. This helps the body to regulate appetite, sleep patterns, and mood. So tryptophan has been used in therapeutic treatment for a variety of conditions like insomnia, depression, and anxiety. 3. Studies have shown that increase in serotonin levels might help reduce migraine headaches.